“We are called to be saints; that’s not something you have to put off until you’re older but can happen now.” With these words the Archbishop of Perth, Australia, Msgr. 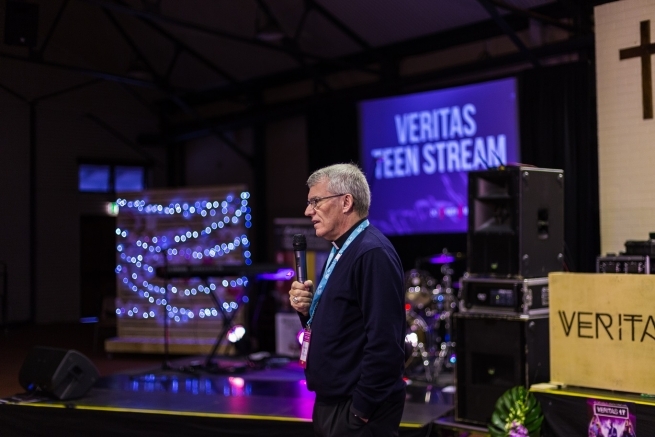 Timothy Costelloe, SDB, launched the challenge of holiness to a group of young people from across the region of Western Australia for the “Veritas” Catholic Youth Festival. At the event, which took place in the weekend from 30 June to 2 July at the Notre Dame University in Fremantle, not far from Perth, about 550 young people participated in spiritual reflections and talks, prayer vigils, workshops, moments of leisure and religious celebrations, all under the motto: "The Lord has done great things in me and Holy is his name." Among the event's guests, besides the priest Rob Galea, star of the local TV program X-Factor, was the Salesian Archbishop of Perth, Msgr. Costelloe, who on Sunday 2, before presiding over the Eucharist for all the participants, had the opportunity to talk with about 60 teenagers on a wide range of topics, from the sacrament of Reconciliation to suffering, to living faith in daily life. The Archbishop reminded the youths that the choices they make today will affect the people they will become in the future and offered them advice on how to deal with their decisions: “One of the best ways to make good decisions is to be guided by the Word of God, which of course comes to us through the Bible, especially through the Gospels, but also through the Church,” he said. Then he indicated a few examples of holiness by the young: Saints Fatima Francisco and Jacinta Marto, and Domenico Savio; he then reminded the teenagers of the teachings on holiness that Don Bosco gave to his young pupil. “Sometimes we think of saints as these people from way back in history who did all these weird and wonderful things. But in fact, it’s not some weird, exotic, out-of-this-world kind of thing, but just a practical living out of life to the full and doing your best in whatever situation you’re in,” the Salesian Archbishop said. Finally, in facing trails of faith, he recalled the phrase of St. Peter, “'Where else can we go? You Lord are the one who has got the words of life. You’re the one who can give us life to the full,’” he said. “That’s been my experience and I’m sure it has been an experience for some of you already."